The third update to my book “macOS Installation for Apple Administrators” is available. If you have already purchased the book, you can get the update in the Apple Books application on your iOS device or Mac. While I was putting this book together, macOS High Sierra was very much a moving target and I had to update and change sections frequently, sometimes while they were being written. Thankfully, the changes to macOS deployment and installation have calmed down somewhat since then. While Mojave and the new Mac hardware have brought some changes, they are not as disruptive as High Sierra, UAMDM and the iMac Pro were. Originally, I made a commitment to update the book up to the macOS Mojave release. This is the book’s first post-Mojave update. I am planning at least one more update to cover any changes the Mojave “Spring Update” might bring. Once we know more about macOS 10.15 after WWDC, I will decide on the book’s further future. As I have outlined in my 2018 review/2019 outlook post, I don’t expect dramatic changes this year, so it will probably make sense to keep the book going for the lifetime of 10.15. It is quite likely that the deployment workflows outlined in “macOS Installation” will serve MacAdmins well for the foreseeable future. This update received quite a bit of new content. I have rewritten and expanded many sections. The book is now eleven pages longer than the third version and sixteen pages longer than the first release. I have added many more links to external pages, tools, posts and support articles where they are available. The update is free when you have already purchased the book. Unfortunately, the “updates” area seems to have gotten lost in the Apple Books app re-deisgn. You can just follow the link to the Apple Book store and the app should tell you that an update is available. If you don’t have it yet, buy it now and get all future updates for free! While you are all watching the progress bars downloading macOS Mojave, I have submitted updates to two of my books! The service-formerly-known-as-iBooks is now called “Apple Books” or just “Books” across all Apple platforms. Whatever the name, my books are available there. Both “Packaging” and “macOS Installation” have received updates with several new passages regarding macOS Mojave and other fixes and rewrites. “macOS Installation” got less changes and updates than I expected for the Mojave update. We have been testing Mojave internally and the strategies for deploying High Sierra still work for Mojave. With the new APFS support for all drive hardware admins should be able to simplify deployment workflows. Nevertheless, I am sure that much more will be revealed over the next few weeks, now that the NDA is lifted and when the first update(s) drop(s). I will keep updating this book also. The content of my third book “Property Lists, Preferences and Profiles” (PR3) has not really been affected but the Mojave release. I am also working on an update for this book with some new content added. When it happens you will learn about it here. Go, get them on Apple Books! My new book is on the available on the iBooks Store. Go get it! I have talked about it before, with a nice long sample chapter. There is one more thought I want to add: I don’t consider this book complete yet. Apple is not only deprecating technologies for macOS deployments (imaging, NetBoot), but the pace for macOS releases is changing as well. I started writing this book in October, shortly after the release of High Sierra. However, with every update to 10.13 it became clear that Apple was not standing still. They kept iterating, sometimes quite drastically. The iMac Pro introduced Secure Boot and we realized that NetBoot-based workflows would need to be retired much faster than initially assumed. Secure Boot also makes booting off external drives quite inconvenient. While this is great from a security standpoint, it removes yet another option for installation workflows. Then they announced that macOS Server would be stripped of nearly all services, again including NetBoot/NetInstall. 10.13.4 added a very useful option to startosinstall. Just recently, Apple changed the infamous HT208020 article (a.k.a. Imaging Killer). I was adding, removing and rewriting parts of the book until the literal last minute. Not even the proofreaders have seen the final version. (Can’t blame the remaining typos on them.) Existing workflows (or planned workflows) had to be adapted for the new hardware and updates. I don’t expect this will stop at 10.13.4, or 10.13.5 or any time soon. We will have to update our practices to be more adaptable, and that includes writing books. I expect that 10.13.5 and future updates, new hardware with new features, and then 10.14 (whatever Apple will call it) will bring more changes. When you buy the book now, you will receive new versions from the iBooks Store when I publish updates with new information, workflows and solutions. I plan to keep this up with the remaining 10.13 updates and all the way to the 10.14 release (presumably this fall). So by the end of this year, you should have a book with great information on how to install High Sierra and how to upgrade to and install 10.14. Like for an app in the App Store, I have to consider how long it makes fiscal sense to maintain free updates. After the 10.14 release, I will evaluate the effort spent and make new plans from there. I will certainly write about that here. There are also some parts of the book that I would have liked to have a bit more detail. I had set the myself the goal to get the book out before WWDC and 10.13.5, so some things had to put on the ‘later’ list. So, in addition to new content forced on us by updates and upgrades, I will keep improving, fixing, and adding to useful content as well. I believe that “macOS Installation for Apple Administrators,” as it is now, already has a lot of great information and is well worth buying and reading. It will get even better. At the end, a short request for help: The book is self-published. There is no big marketing machine behind this. If you like the book, then please leave a review on the iBooks Store. Apple’s stores segregate reviews by region, so every single review makes a big difference. You can also help by recommending the book to another MacAdmin or presenting it at your local MacAdmins meeting, or just by simply sharing or re-tweeting my posts on social media. High Sierra came with many changes for Mac administrators. Some of them were anticipated, some of them weren’t. When Apple announced APFS would be deployed to every OS by 2018, Mac Admins thought that would be the main challenge and the reason for sweeping changes in the structure and functionality of macOS. At the same time it was obvious that Apple liked the way MDM was in the center of all management for iOS and wanted to have it play a similar role for macOS. The extent how far Apple would push it was unclear. While APFS has certainly come with some challenges, mainly for managed FileVault users, it was not the “Macnarök” that we were expecting. I am not including these links to make fun of the authors – quite the opposite. At the time there was justified anxiety about the future of macOS adminstration and these posts (and many others) put this into words. I believe that because of MacAdmins blogging and presenting about their concerns and anxiety, talking with Apple Reps and filing bugs, as a community, were able to influence the course Apple is taking. It is definitely a slow, frustrating and opaque process, but not entirely fruitless. However, other new “features” of High Sierra such as UAKEL and, later with 10.13.4, UAMDM provide their own set of hurdles administrators have to clear. Let’s look at these challenges and some solutions to them in detail. Imaging has been the means to quickly and reliably install macOS to clients. It could scale from an external drive for a few clients to a NetBoot infrastructure for large deployments. Apple has come out explicitly and said that imaging in most forms is not recommended or supported any more. In the early days imaging meant building a ‘Golden Master’ image with all configuration and software ‘baked in,’ which then would be deployed to all the Macs. Creating this ‘Golden Master’ image was a lot of work and the result quite fragile and error-prone. Macs would usually be kept on a specific version of ‘the image’ for months or a year without updates. 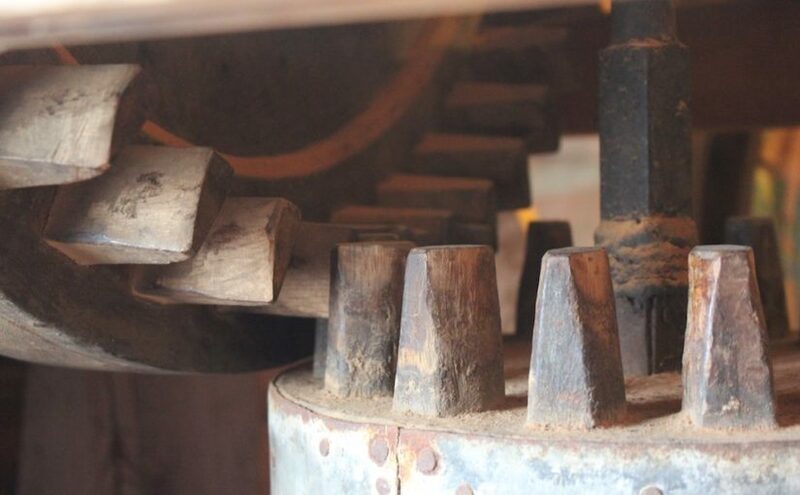 Since the process of manually building the Golden Master was tedious and error-prone, administrators started to automate the process. Tool chains of packages, scripts and other tools could build the master image (or most of it) automatedly. InstaDMG was one of the first tools to do this. AutoDMG is a direct successor of this approach and still useful for many tasks today. The same packages and scripts that automated the configuration of the master image could be used to install and update software on ‘live’ Macs. Management tools, like Munki, Casper (now Jamf Pro) and Filewave, can deploy updates to clients automatically without user interaction. As work was moved from preparing the master image to maintaining the live system, the master image became thinner and thinner. While this approach is slower than monolithic imaging, it is more flexible and allows to keep the system and software on the client continually updated, without having to re-image. Some workflows even skipped the imaging entirely. When you get a Mac out of the box it already has macOS installed, all you need is to configure it to connect to your management system, which will take care of the rest. Some administrators had already moved to ‘thin’ imaging or ‘no-imaging’ workflows before High Sierra and pronouncements that ‘Imaging is Dead!’ have been made years ago. Administrators using thin imaging or no-imaging workflows will find they are better prepared for the High Sierra installation workflows. Mac administrators now have to build new workflows based on the Apple’s supported installation methods for High Sierra. These all rely on the macOS Installer application in one form or another. Using the macOS installer application to upgrade a system from 10.12 is straightforward enough and similar to what was possible with the startosinstall command since OS X El Capitan 10.11. 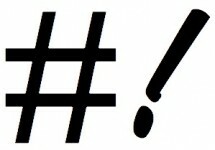 The main challenge are ‘nuke-n pave’ workflows, where the system on a Mac is erased and overwritten with a new system. This workflow is easy with traditional imaging. In fact, it was easier and faster to just image over a system, rather than upgrade. The startosinstall --eraseinstall option added in 10.13.4 makes an installer based ‘nuke’n pave’ workflow possible with the macOS Installer application. In the new High Sierra world of Mac deployment, we face the same challenge: how do you connect an ‘out-of-the-box’ macOS to your management system. Apple’s answer to that is clearly DEP. DEP will tell a freshly installed Mac which MDM server is ‘responsible’ for it. The MDM server can then use the InstallApplication MDM command to install and configure a management agent, which together with the mdmclient performs the remaining configuration and software installation. Up until 10.13 Mac administrators could ignore and not use an MDM for Mac deployment and management. There were a few useful features, but there are also many tasks an MDM cannot do or that a local agent can do better. With High Sierra MDM became essential to manage and support UAKEL. In the early versions of High Sierra, merely being connected to an MDM would disable UAKEL, starting with 10.13.4 UAKEL can be managed with a configuration profile which has to be pushed from a user approved MDM. Like supervison for iOS devices, UAMDM adds an extra level of approval and provides an additional level of control over the macOS client device. UAMDM will be required for more and more essential functionality going forward. However, as the name implies, a ‘user approved’ MDM needs to be interactively approved by a user at some time during deployment which creates an enormous challenge for automated workflows. Apple claims that DEP enrolled devices are automatically user-approved. However, even the DEP enrollment still requires user interaction in the Setup Assistant. Also DEP is not available in all regions and it may not be possible for organizations to add all existing Macs to their DEP account. DEP also requires Apple DEP servers to be accessible. 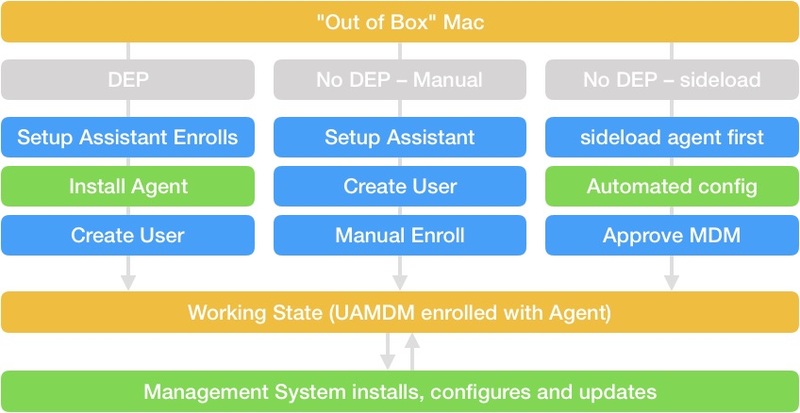 So during this transition phase and for some other situations, Mac administrators have to have a non-DEP workflow solution to get a UAMDM enrolled device. Finally the iMac Pro introduces a new system controller with secure boot. By default all external means of booting an iMac Pro are disabled. NetBoot/NetInstall is not supported on the iMac Pro at all. You can enable booting off external drives, but the process to do so is quite convoluted and cannot be automated. So for administrators, the option is fairly useless. With the startosinstall command administrators can achieve the necessary management steps from within the local system. You can either upgrade the existing system or ‘nuke’n pave’ with the eraseinstall option. However, the eraseinstall option is limited to systems that are already on 10.13 with an APFS file system. On the iMac Pro you can safely make that assumption, but for ‘older’ Macs and systems you usually cannot. So administrators need a second workflow for systems and hardware that cannot run the eraseinstall option (yet). The Recovery system, external installer volume or NetInstall are the Apple Supported means which can ‘nuke’n pave’ a Mac. NetInstall is the only means that can be automated. However, there are other solutions such as Imagr or a modified DeployStudio workflow which can achieve the same goal using the macOS Installer application and startosinstall. Deployment strategies and workflows are as varied and individual as the organizations that use them. But with the challenges listed above, I believe we can state a few pieces that are necessary for a new deployment workflow for High Sierra and hopefully going forward. First, any deployment workflow should be designed to start with a clean ‘out-of-box’ macOS. This way the same workflow can be applied to new Macs and to Macs that were just re-installed. At the end of the installation workflow the Mac is enrolled and user-approved with your management system, so that it can take over and perform the remaining configuration and installation. All configuration steps should be controlled from the management system and be executed independently of which deployment workflow was used. DEP is the Apple-preferred means of connecting a new device to your MDM. Even when you require a non-DEP workflow for older Macs you should implement a DEP workflow. It is likely that Apple may make DEP enrollment mandatory in the future. However, right now in the transition phase, you will need a second workflow for machines that cannot be registered with DEP. For the non-DEP workflow, you can choose between manual enrollment, which happens after the user has booted and logged in for first time, or some sort of ‘side-loading’ where you add the MDM and management system configuration to a system, before it even boots for the first time. On Macs that still support NetBoot, you can also use tools like NetInstall, Imagr or DeployStudio. Either way you should do this before first boot of the system. You will have to plan for this user interaction. In some cases, such as individual-use devices, the approval of the management will be part of standard first setup and will be done by the end user. In other situations such as classroom setups, it will be harder to make this part of the workflow. Some management systems let you scope software installations and configurations depending on criteria reported from the device. In this case you can set up your workflow so that installations that rely on UAMDM (third party kernel extensions) are deferred until the MDM is approved. Either way, the end-result of each of these paths should be a Mac that is enrolled (user-approved) with your MDM where the management system is installing, configuring, maintaining the system and software. You will also need a second set of workflows that bring a Mac from any state (even a broken one) back to the ‘out-of-box’ state so that you can start over (or retire it). The first option uses the startosinstall --eraseinstall command. This is easiest to automate and works on new hardware like the iMac Pro. However, it will not work on Macs without APFS systems and older versions of macOS. The Macs that cannot use the eraseinstall option, however, can use NetInstall or a similar NetBoot based tool. 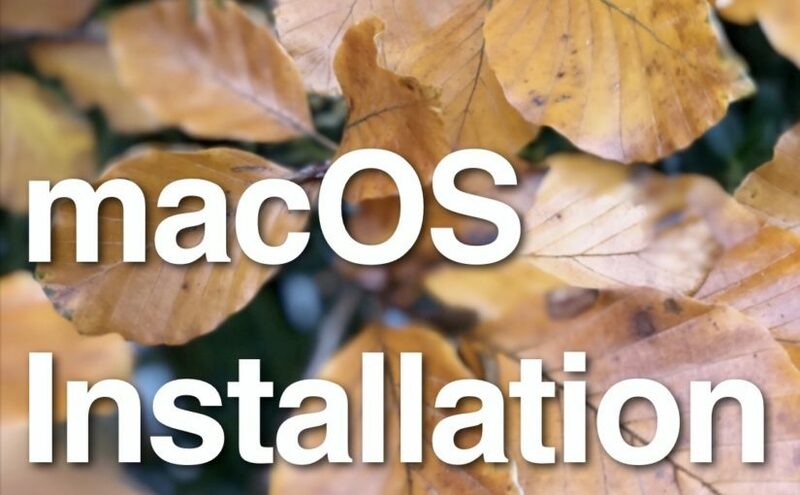 You can use the macOS Install application and startosinstall with Imagr and DeployStudio, so this combination will run the installer and can make sure the firmware is up to date as well. Note that the workflows and tools for restoring a Mac are also used to ‘sideload’ the agent configuration on to a Mac. You can add the MDM/agent configuration to the restore workflow to save some steps here. However, since NetBoot based workflows are transition solutions to support ‘old’ Macs and systems, your deployment workflows need to work with ‘out-of-box’ systems as well as pre-configured systems. In the transition phase until all hardware supports eraseinstall you will need both workflows available. You should also have documentation, training, and support articles to instruct administrators, techs, and users to restore a Mac to ‘out-of-box’ state with (Internet) Recovery or an external boot drive. While this should be an option of last resort, it will be necessary in situations where a Mac cannot boot otherwise. Obviously, these are very high level views of the workflow and the devil is very much in the details of the implementation. Even a book can only skim the surface of any implementation. Nevertheless, once you understand and accept this framework, the necessary detailed steps become obvious, though not necessarily easy. Many thanks and credit need to go to Anthony Reimer, whose excellent presentation at MacAD.UK 2018 helped me sort through my own thoughts on this topic. Apple had an event yesterday at a school. You may have heard. If you are not working in education tech the news probably seemed underwhelming. Don’t worry, Apple will have more events and some of them will have great news for you. I am not going to discuss the entire event. I don’t currently do much work in education IT and when I do it is for Macs, so I don’t feel very qualified to address most of what was shown yesterday. However, there was one topic on which I was hoping for news: iBooks. However, as it is often the case with Apple, it was neither the news I was expecting nor hoping for. In case you didn’t know: I am interested in iBooks because I have published two books written with iBooks Author. There were some signs in the recent iOS beta releases that Apple seems to be preparing to change the iBooks app’s name to simply ‘Books’, and iBooks Author has found its niche in education, so this education focused event seemed like a place for an announcement. The hopes were up! As I said, the announcement on the book publishing front is underwhelming. The new Pages (version 7.0) has improved ePub3 fixed layout support and some new templates. This is not a new feature. Pages has had ePub export for a long time. So far it has focussed on free-flowing layout. Last year, Pages 6.3 gained the ability to create and export fixed-layout ePub formats. Back then I was really interested to have a solution other than iBooks Author. However, the feature set of Pages for fixed layout is quite rudimentary compared to iBooks Author. I have not had time to really test the latest version of Pages yet, but I can already confirm that some really important features are still missing. iBooks Author forces you to structure your book with chapters and sections, but also builds an interactive table of contents automatically. iBooks Author provides interactive widgets for images, movies, and even Keynote presentations that go fullscreen on tap. Also scrollable sidebars which I use in my books for scripts and source text that is longer than fits on a screen. I can also create links in text to other parts and objects in the book. None of these features are present in Pages. In iBooks Author you can send a preview to iBooks on a connected device. In Pages I have to export as ePub and find some way to get it to the target device. But the most damning thing is, there is no way to import an iBooks Author document or template into Pages. I’d have to start over and rebuild the book in a new layout. However, the situation is not all bad. Apple has also stated that iBooks Author is not going anywhere. For now I would presume we are in a transition phase, where the ‘old software’ is kept around for compatibility and certain features until the replacement can live up to expectations. Apple has done that before with iMovie, QuickTime and even AppleWorks. I’d rather have a brand new iBooks Author or a feature complete Pages sooner than later, but as long as iBook Author keeps working, well, I guess I can wait. So, what am I going to do with my books? You might have guessed from my analysis: I am sticking with iBooks Author for the existing books. I have about 500 pages in several books in various stages of completion. As long as there is no easy way to export them out of iBooks Author, they are staying in there. However, there are some limitations of iBooks Author that I am quite aware of and that I have been looking for solutions to. However, self-publishing in the iBooks store is not available in every region. Even some countries where an iBooks store is available don’t allow me to publish to them. It is not easy or even possible for everyone to get a US Apple ID to purchase items in the US store. So far I have only gotten a handful of requests from readers with this problem, but I do feel sorry for every one of them (and am aware that there will be many more who just gave up without asking). I’d also like to be able to write not just on a Mac but on an iPad or even the iPhone, whenever the inspiration (or boredom) strikes me. Right now I solve that by typing (and sometimes even dictating) my ideas into Notes and then copying them into iBooks Author later. However, this workflow does not allow me to review or rewrite parts of a book on the road. Finally, as an admin and coder, I have gotten used to git and some sensible form of version control for the writing process would be nice, too. So, to address these problems I have been looking for an alternative means of publication. Last week I was recommended Leanpub (thanks, Rob!). I believe their approach to publishing is well suited for technical books. However, their workflow is entirely based on a markdown variant and builds free-flow ePub books. That means they are more flexible and can support many more reader platforms. On the other hand, the options for rich media and interaction are much more limited (if non-existent). I am not even sure if videos can work reliably in this format (though I plan to try). On the other hand Leanpub provides better rates for publishers/authors and have a ‘publish early and often’ mentality. They actually allow (and encourage) publishing and selling an ‘incomplete’ book and pushing updates to customers. They even integrate git into the publishing workflow. As far as I can tell they also sell to anywhere in the world. I will keep ‘Packaging’ and ‘PR3’ in iBooks Author format and the iBooks Store for the forseeable future. Right now converting them to another format would take too much work and time that I’d rather spend on other projects. I will keep updating these books with fixes and new topics. There is a third book that is more than half complete which I plan to keep in iBooks Author format for the same reason (this one has quite a number of screen capture videos, which would be a pain to convert to something else). I hope to get to a point where I can talk more about this project soon. Finally, I have (yet) another project, which I believe is well suited for Leanpub. Last summer, I posted a series of ‘Terminal Primer’ articles and have kept working on that series with a ‘Terminal for Apple Adminstrators’ book in mind. I will (re-)build and publish this in Leanpub as an experiment. For now there is only a ‘stub’ page available, but you can sign up for updates on this project. Of course, I will publish updates on this project here and on Twitter as well. The advantage of self-publishing a digital book is that I can write and make updates. Some people have pointed out typos (thank you!) or had questions or comments about the book. In some cases a question from a client or a MacAdmin Slack forum member will make me re-visit a section of the book and then add or re-write a paragraph or two. The really great thing is that when you have already purchased the book, you will get the new improved update for free! And even if you have not bought the book yet, then you can know that when you buy it now, you will keep getting improvements in the future. It’s all just bits and bytes after all. 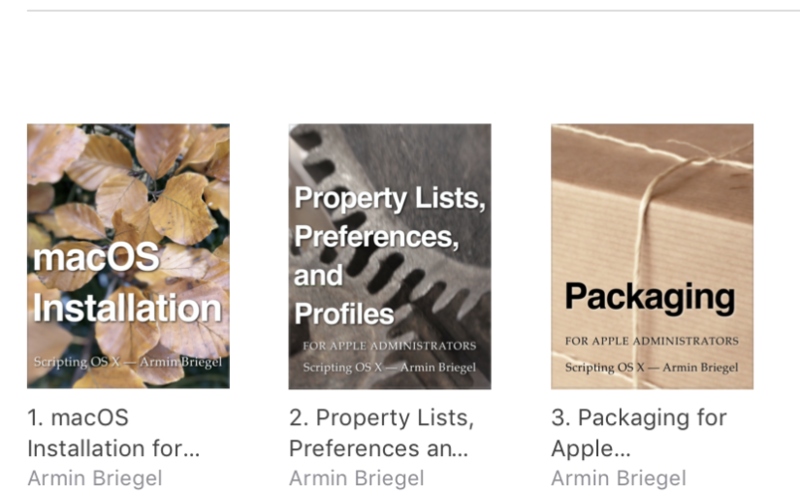 All of that said, the latest version of my book ‘Packages for Apple Administrators’ is now available on the iBooks Store. I have fixed many typos and clarified a few sentences and paragraph. 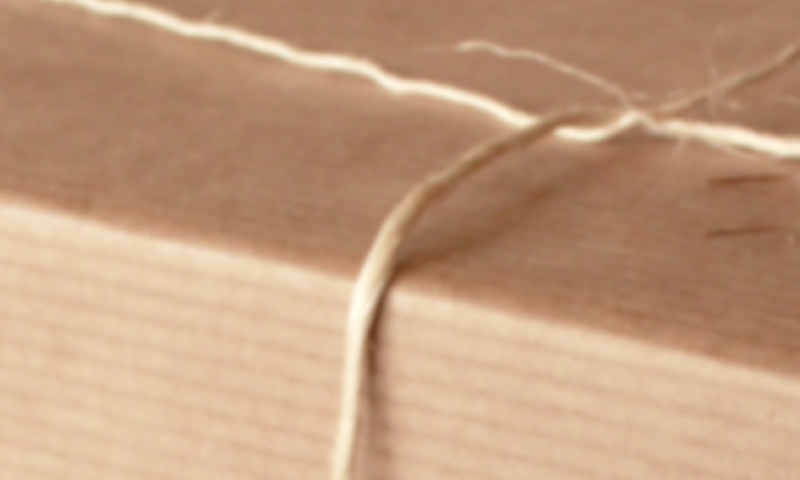 I have expanded and clarified the instructions for signing packages. There is also a new segment on the order of installation with distribution packages. If you have already purchased books, all I ask in return for the free update, is to go to the iBooks Store and leave a review. The iBooks Store segregates reviews by territory, so every single one of them will be very important for other users to find and evaluate the book. Last week, fellow MacAdmin Kyle Crawford has discovered that on macOS High Sierra the defaults will delete a property list file with invalid plist/XML syntax, even when you just attempt to read data. Erik Holtham has a more detailed OpenRadar bug. Patrik Wardle has found the relevant code, which deletes the file when it doesn’t validate. This is bad. Thanks to all involved for finding, documenting and sharing this. This is new behavior in High Sierra. I am not yet sure which version of High Sierra this new behavior was introduced. The behavior makes sense in the context of an application attempting to read a settings file, but the defaults tool deleting arbitrary files is, of course, dangerous. Update: This behavior has been fixed in 10.13.4. However, it is still good practice to avoid defaults for anything other than actual preferences files. As usual, don’t panic. This will only affect Macs running High Sierra and corrupt or broken files. However, if you have a script that accidently points the defaults command at a different file, it will delete that. So you have to use it with care. Alternatively, you can and should use plutil or PlistBuddy to read and modify property list files. $ /usr/libexec/PlistBuddy berry.plist -c "print size"
$ /usr/libexec/PlistBuddy berry.plist -c "set size enormous"
PlistBuddy has the additional advantage of allowing to add or edit values nested deep in dict or array structures. You can get more information on PlistBuddy in its man page or my book. The interactive mode of PlistBuddy is also very useful. So the defaults command is dead? WARNING: The defaults command will be changed in an upcoming major release to only operate on preferences domains. General plist manipulation utilities will be folded into a different command-line program. As this warning states, the defaults tool reads and writes data to plist files through macOS’s preferences system. This has the advantage that the tool gets (and changes) the current value whether it is cached in memory or not. When an application is listening for notifications that a preference has changed (not many do) then it will be notified. Files for preference domains are usually stored in /Library/Preferences/, ~/Library/Preferences or their ByHost subfolders. Sandboxed applications will have their preference plist files in their container. There, however, many other files that are property list files which are not part of the user defaults system: launchd files, configuration profiles and AutoPkg` recipes to name just a few. Mac Admins commonly use the defaults tool, despite Apple’s warning, to create, read and edit generic plist files. As mentioned above, plutil, PlistBuddy or direct manipulation through Obj-C, Python or Swift, are better choices for generic plist files. Greg Neagle posted an article recently where he describes how he sleuthed a way past an annoying High Sierra bug. In High Sierra when you add more than one package to a custom NetInstall workflow with System Image Utility or startosinstall all the custom packages will fail. 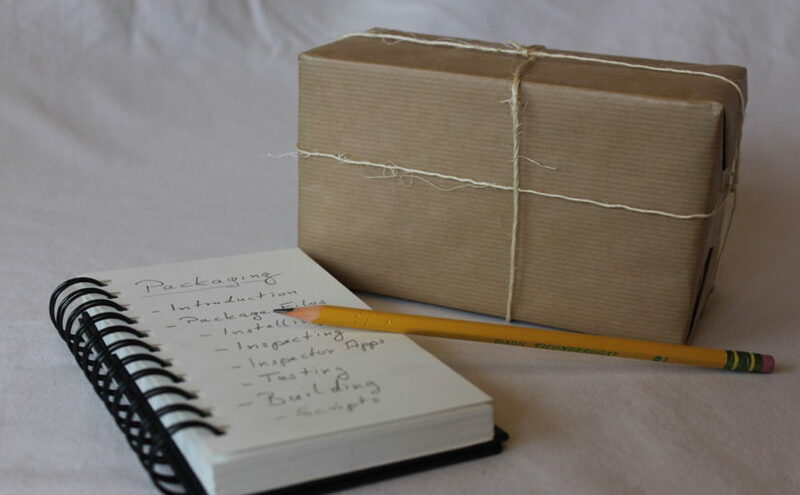 Greg’s workaround involves adding an identifier and version to each of the distribution packages. It is still an open question why this data is required, but the workaround is easy enough. I have added a section on how to do this to the “Building Distribution Packages” section of the book. As always: if you have already purchased the book, you can download the update with new content for free in the iBooks application on your Mac, iPad or iPhone. Or go and get the book now! Rich Trouton also updated his “First Boot Package Install Generator Tool” to provide this data.